There comes a time in every pilot's flying “career” when you must push beyond the private pilot single engine land rating and earn the legal FAA right to fly on instruments. From the day I earned my ASEL ticket in 1996, I knew I'd one day add the instrument rating to my license, but just as it was when I earned my private, lots of roadblocks stood in the way. Call it the aligning of stars, a ship coming in, or the manifestation of something brought on by the Law of Attraction. Call it luck or call it great business acumen, but our phone has been ringing off the hook this year. This additional business has created the need for me and the creative team to find a fast, efficient way to cover the Western United States without having to wade though the nonsensical hogwash of airline ticketing and pricing, and their insane and inefficient hub and spoke system. Why? Well, let's just say that those stories about endless rain here are not all myth. Yes, many locals will tell Californians that it pours buckets 24/7/365, hoping to keep them on their side of the Siskiyou Range. But the truth is, if you want to get out of the Willamette Valley on most days from October through late March, you had better plan on filing IFR to plow through the crud and get up on top. So today I begin the journey of earning one of the toughest tickets in aviation. 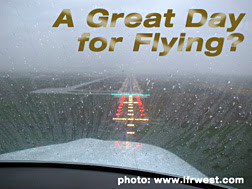 I have had the itch to fly IFR since meeting Field Morey, owner of Morey's West Coast Adventures in Medford, OR. Field – who says he's named after an airport because his pop couldn't name him runway – takes pilots on IFR Adventures into seriously cruddy real weather to Alaska, the Rockies, SoCal, the Idaho backcountry and the Southwest in his Chelton-equipped Turbo 182, or his brand new 2007 G1000-equipped Turbo Skylane. He became a new client this year, and when I updated his website, I became hooked on what he teaches. But Field's IFR Adventures are out of my league. At 275 hours with only a handful of those under the hood, I am not ready for his intense, advanced IFR teaching trips. So today I meet with a CFI-I to get the ball rolling, taking baby steps towards Job One...passing the written. I will work to improve my scan on my X-plane simulator, and shoot endless simulated ILS approaches, trying to strengthen my skills, which are rusty when it comes to simple tasks like flying the VOR needle. I figure about 60 days of book learnin' ought to do it, using the Gleim CD-ROM system recommended by my CFI-I. About the time that I finish that course and pass my written, I will be flying home (VFR) my new (previously-loved) Cherokee, sometime in August or September. After 20 hours in the right seat of the new bird, I will begin amassing real-world hood time, working towards the day when I pass the check ride and the FAA turns me loose into the clouds, sometime next winter. Earning that ticket in the heart of a notorious Pacific Northwest storm season ought to be, um, interesting...but also oh so rewarding.